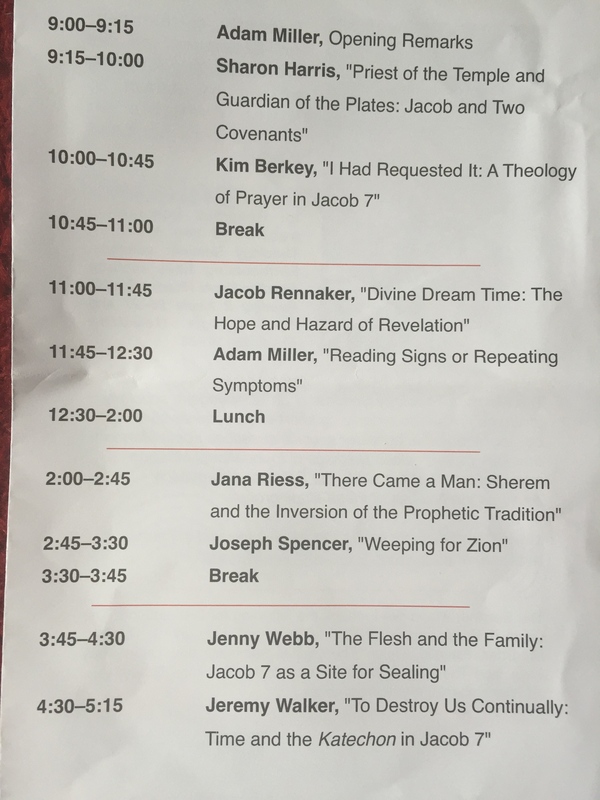 Yesterday I spent a very productive day at the Mormon Theology Seminar conference at the Union Theological Seminary in NYC. The papers and discussions were fantastic. One of my friends said it was the best discussion he’s been a part of in the past 10 years and more intellectually satisfying than anything he experienced as an undergrad at Princeton. Congratulations to the organizers and all the participants. I don’t want to steal any of the thunder from any of the presenters and their work, and look forward to seeing their papers published. In the meantime, after a day and now a night of thinking about the Sherem v. Jacob showdown, here are a few of my own thoughts and questions about this amazing chapter. Lots of ink has been spilt on this question. After spending more time looking at this story, I am persuaded to see him not as a complete alien outsider but as a priest from within the closely related Lamanite/Lemuelite lineage. This would make him a fairly close kinsman of Jacob (who he calls Brother Jacob), perhaps a nephew or grand-nephew, maybe even one who he may have grown up with in the wilderness or the early days in the promised land. This would explain how he was so thoroughly versed in the still shared language of the people of Nephi–as well as his apparent deep familiarity with the scriptures. He believes in the scriptures, and may have had a copy of them–but he reads them the way that Laman and Lemuel apparently would–as justifying the Law of Moses (and Jerusalem temple rituals) as the path of righteousness. It’s hard to imagine anyone outside of the original Lehite group being so versed in the language and scriptures, and so tied to the Law of Moses. In my mind, Sherem isn’t just a missionary from the Lamanites to the Nephites, but possibly a rival priest trying to unite the Lehites under his own cult based on the Law of Moses. If Sherem is a close kinsman and rival priest–from the Lamanite/Lemuelite tradition, what else might be going on here? One thing I’m wondering about are the Brass Plates. Who has them this point? King Nephi II or III? Or Jacob as the temple high priest? I tend to think Jacob probably had them. Which makes it interesting that he portrays Sherem has having mere “flattery” and “much power of speech” and he seems to contrast “the words of this wicked man” with the scriptures (Jacob 7:23). Is Sherem–who claims to believe in the scriptures, but has a non-Christian interpretation of the scriptures–making a claim here not just that his interpretation of the scriptures is more valid, but that perhaps he should be the caretaker of the actual physical scriptures (Brass Plates)? Is this an attempt to reclaim the plates–which according to Lamanite tradition and been stolen by Nephi the usurper? Is there more to this showdown than perhaps we’ve considered before? Same thing with the temple. Jacob is the high priest over the temple and Sherem has “come unto” him–where is this “unto” that Sherem has come? To the temple? Is this a showdown in the temple? Is Sherem coming to claim rightful ownership of the temple, scriptures, and hearts of the people? If so, is there a ritualistic experience that happens as part of this showdown that we are missing? For instance Jacob claims that in giving Sherem a sign, that his Father in heaven “had heard my cry and answered my prayer” (Jacob 7:22)–but that prayer is unrecorded, unless it is just the mere 10 words at the end of verse 14. Did something more than just an exchange of words happen here at the temple? Something that ritually opened the heavens so that the “power of the Lord” could be manifest? I think we often imagine that Sherem was “struck down” by the Lord. But what we are really told is that “the power of the Lord came upon him, insomuch that he fell to the earth” (Jacob 7:15). This sounds more like what happened to the Sons of Mosiah, Alma the Younger, King Lamoni, and Lamoni’s father. Indeed, after he recovers enough to be able to speak, Sherem testifies of Christ and the ministering of angels, as well as of hell and eternity. So he seems to have had some sort of visionary experience. But rather than coming out converted and hopeful, he comes out in fear for his soul. So what really happened here, and why wasn’t he converted like the others who seem to have had similar experiences? We tend to see Sherem as an Anti-Christ along the same lines as Nehor and Korihor–who were both killed. And Sherem’s death seems to put him in that same camp. But why did he have to die? He may not have been fully repentant, though he confesses his sins before he dies. What is going on with Sherem’s death–and perhaps the other Anti-Christ’s deaths? Is it important for us to see their deaths as part of what it means to be Anti-Christ? How are their deaths in opposition–or Anti–the death of Christ? Sherem got his sign–why did he need to die? After Sherem “gave up the ghost” the people have some kind of experience described with the same language as whatever happened to Sherem: “the power of God came down upon them, and they were overcome that they feel to the earth” (Jacob 7:21). Did they have similar visions? What happened to them? Why didn’t they die? Or did they? Why aren’t we told more about what really happened here? Is there a connection to what happened to the people, and the comment that “peace and the love of God was restored again among the people”? Why does it seem like we’re not getting the full story here? And who were these “people” that had this experience? All the people of Nephi? Just those that had believed the teachings of Sherem? These are just a few of my own questions, questions that were touched upon in some of our conversations yesterday. The conference papers themselves go into many, many other aspects of this story and obviously under-explored chapter of scripture–into whole other dimensions of exploration, some of which I’m barely if perhaps not even capable of following! Among other amazements, we were treated with a glimpse into the familial psycho-dynamics that may have structured the showdown, the possible implications of Jacob’s continual and never fully resolved mourning, and how the Lamanites’s continual attempts to destroy the Nephites may relate to an already manifest and yet still to be manifest experience of the Messiah. It was a true feast upon the word. Who knew that this short little scriptural showdown could hold so much. I’m blown away by Jacob 7. When you get a chance to hear or read these talks, make sure you take the opportunity! Have you ever tried to make a children’s story out of a scriptural story? How did it go? Have you had an experience where teaching children helped you understand an underlying message in the story that you had missed before? One Sunday we were reading the story of Jonah to our kids. As we read it we gave a little background and noticed how comical and fanciful it was. In fact, the flow of the story reminded me of a cherished children’s book: The Runaway Bunny! While I assume our ward is behind most in the Church, I decided it would be helpful for me to write up my thoughts before teaching tomorrow. Hopefully it will spark some interesting conversation here in the Feast community as well! The lesson can be found online here. The Book of Isaiah opens by properly sharing its theme, but I don’t know in what tone it was meant to be delivered. It starts out clearly enough, “The vision concerning Judah and Jerusalem that Isaiah son of Amoz saw…,” but should we read what follows as a rebuke or a beckon?